Arnold Janssen was born on November 5, 1837, in Goch, a small city in the lower Rhineland of Germany. The second of ten children, he was raised by devout Catholic parents. The family's prayer, which would come to guide Arnold in his life's work, included a nightly rosary followed by the Prologue of St. John's Gospel: In the beginning was the Word, and the Word was with God and the Word was God. As a young man, Arnold studied natural sciences at Bonn University and qualified to teach high school. 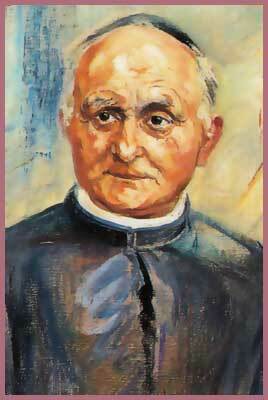 He went on to study theology and was ordained a priest for the diocese of Münster in 1861. He taught mathematics and natural sciences in a secondary school at Bocholt, where he was known as strict but fair teacher. In 1873, he resigned from his teaching post and founded a monthly magazine, The Little Messenger of the Sacred Heart, in order to get people to pray for the missions. He also intended the magazine to be a means of recruiting more German men and women for the missionary work of the Church. In the June issue of the first year of publication, he wrote: We turn to priests and seminarians who are shortly to be ordained. Is there no one among them in the whole of Germany who feels called to dedicate their life to the missionary cause? What about German priests coming together at a safe place to build a German mission seminary? The "Kulturkampf" of the German Chancellor Otto Bismarck was raging with its anti-Catholic laws, and priests were being expelled from the country while the bishops were being imprisoned. Many people considered that the times were not right for the founding of a seminary, but Fr. Arnold was not deterred. The bishop of Roermond said of him, He's either a fool or a saint! Fr. Arnold founded his mission seminary across the border in Steyl, Holland on September 8, 1875. The hand of God was with him and the new order began to flourish in contrast to all expectations. The academic year of 1876/77 began with 15 candidates in four classes, and in March of 1879 the first two missionaries set out for China. On December 8, 1889, Fr. Arnold founded the Missionary Sister Servants of the Holy Spirit, who sent their first missionaries to Argentina in 1895. A man of deep prayer himself, from the beginning Fr. Arnold desired that there should be constant prayer before the Blessed Sacrament to bring about the success of the missionaries. The Sister Servants of the Holy Spirit of Perpetual Adoration were founded on December 8, 1896. In his sermon, the Founder said: The cloistered Sisters should sit at the feet of the Lord like Mary, glorify him day and night through the Divine Office, and hold perpetual adoration before the Blessed Sacrament. In this way they will call down rich graces on the Church and the Congregation. Fr. Arnold guided the mission entrusted to him faithfully for 34 years. At his death on January 15, 1909, he had about 1,800 spiritual children in his three Congregations. The spiritual heritage we have received from him is firmly anchored in the mystery of the Trinity. He saw the Word as coming from the Father, coming in the power of the Holy Spirit, to share the human condition and open our history to its destiny through his death and resurrection. He was devoted to the Sacred Heart of Jesus because he saw it as the expression of the love of Christ for the Father and for us, as it glows with zeal for the honor of the Father and for the salvation of souls. The veneration of the Holy Spirit flowed from his love of the Trinity. Fr. Arnold gave as a special common goal to both branches of Sisters the injunction to love, adore, and glorify the Holy Spirit as the Father of Love and Giver of Graces. He gave the Adoration Sisters a rose-colored habit as a reminder of the love of the Holy Spirit. Arnold Janssen was beatified by Pope Paul VI in 1975 and canonized a saint in the Roman Catholic Church in 2003 by Pope John Paul II. Today there are about 7,000 Divine Word Missionaries active in 70 countries, about 3,800 Holy Spirit Missionary Sisters, and about 400 Holy Spirit Adoration Sisters.